In 2004 the world was introduced to an incredible family – the Incredibles. Actually, they are the Parr family. Audiences probably remember that Supers, aka Superheroes, have been outlawed and they are living regular lives, well, as regular as they can. 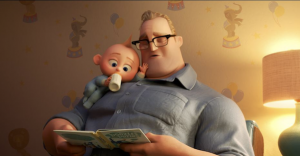 Incredibles 2 begins about 30 seconds after the end of the first film and takes audiences on a fun adventure with the entire Parr family, especially little Jack-Jack. Actually, you could say Jack-Jack is the star of the show! When approached by a tycoon who wants to bring back Superheroes and make them legal, Elastigirl, aka Helen Parr, is offered the first assignment. She is tasked with saving people from horrible fates so she can prove that Supers are necessary and worthwhile and should not be outlawed. But to take on this assignment Mr. Incredible, aka Bob Parr, must also take on a new role, that of stay-at-home dad. He feels confident he can handle the three kids with no problems. After all, how hard is it to get them fed, to the school bus on time, help them with their homework, take on the emotional upsets of a young girl’s first date, and look after a tiny baby? As the audiences, and soon the Parr family, discovers, Jack-Jack isn’t your ordinary baby. He has powers – and not just one or two. He has a lot of powers. He’s a super baby. Soon the entire Parr family finds themselves in the middle of a Super catastrophe. 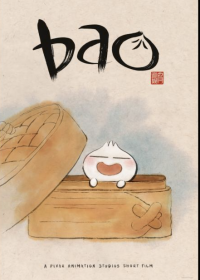 Before the movie is the new short Bao. It’s a cute little film about a mom who is suffering from empty nest syndrome. Then, magically, one of her dumplings comes to life and she once again has a little guy to care for. But this little dumpling soon starts growing and eventually leaves the nest. No one stays young forever. 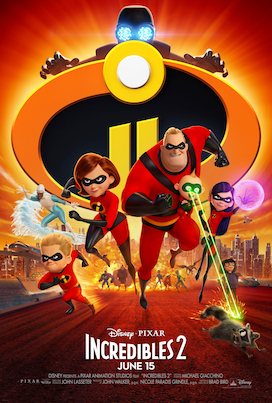 Incredibles 2 is a fun frolic through the lives of this incredible family. It’s filled with plenty of laugh-out-loud moments. And, as stated earlier, little Jack-Jack steals the show, or at least every scene in which he is seen. What a cute – and scary – baby. And Violet and Dash have some great scenes as well. 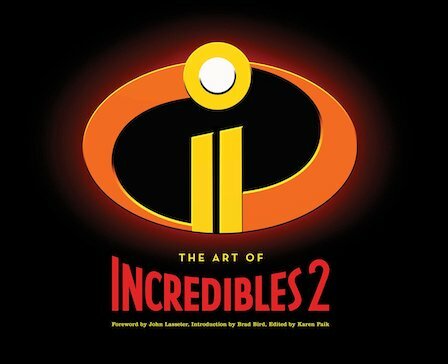 If you love the visuals and the characters in the movie, “The Art of Incredibles 2” is a great book that takes you into the creation of the scenes and the characters. With a foreword by John Lasseter and an introduction by Brad Bird, readers get an inside look at the creation of the film. The house the Parr family uses is a typical mid-century modern house with great open spaces and plenty of rocks and stone. Lasseter admits he grew up in a mid-century modern house and says the designs of them are “cool” to those of us today. Mid-century modern is “on trend” these days, so having the Parrs live in one of these beautiful homes is the perfect touch to the story. Bird explains, “The core idea of Incredibles 2 – a role reversal between husband and wife superheroes Bob and Helen Parr – was one that I had a long time ago…” Many of today’s audiences can relate to this situation. As readers flip through the pages of the book, there are countless images of the characters and the items used in the film even drawings of the cereal boxes enjoyed by the Parr family. When audiences see the scene in the film when the family goes to dinner at The Happy Platter, most of them will recognize the architecture as also being mid-century. Images of this place are part of the book. The book highlights the creative genius that went into crafting this new film. As readers turn the pages there are new drawings and images that recreate the fun of the film. “The Art of Incredibles 2” makes a great coffee table book and is always fun to flip through to see how these images became part of this great movie.